The Pittsburgh Steelers have weathered an onslaught of negative news from the national press. Le’Veon Bell, Antonio Brown, Emmanuel Sanders and even Josh Harris (who?) have made the rounds taking their pot shots at Art Rooney II, Kevin Colbert, Mike Tomlin and Ben Roethlisberger. 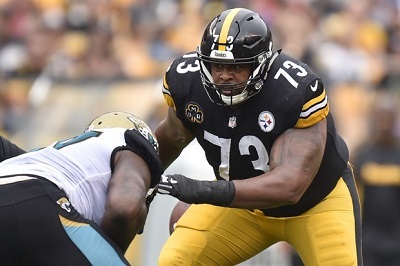 The Steelers quartet has largely remained silent, although players like Maurkice Pouncey and Tyson Alualu have spoken out. Frankly, I think it’s high time for more Steelers to start going this route. I also think it’s time for the organization and Roethlisberger to defend themselves with some sort of media availability of their own. Tim Benz’s sentiment is understandable, but he’s wrong. 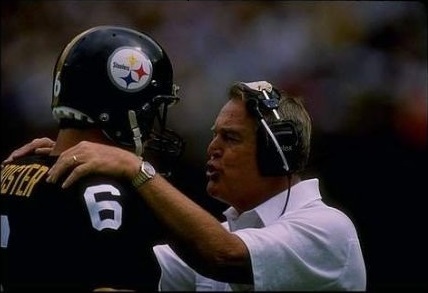 If the Steelers as an organization are looking for precedent in how to handle such a situation, then they should look back 30 years and follow the example that Chuck Noll set in his darkest hour as head coach. The 1989 Steelers opened the season with a 51-0 loss at Three Rivers Stadium to the Cleveland Browns. They followed with a 41-10 loss to the Bengals in Riverfront Stadium a week later. The combined 92-10 opening losses sent vulchers circling Three Rivers Stadium. The 1989 Steelers rallied around The Emperor. They upset the then Super Bowl favorite Minnesota Vikings the next weekend and shut down Barry Sanders and the Detroit Lions the week after that. Although they would endure two more shutouts that season, at 4-6 Noll boldly declared the playoffs were in the Steelers sights. Critics scoffed, but the 1989 Steelers made the playoffs, upset Jerry Glanville’s Oilers, and were a bad Chuck Lanza to Bubby Brister snap (ah Dermontti Dawson, why did you have to get cramps) and a dropped Mark Stock pass away from reaching the AFC Championship game. Unfortunately, the 2019 Steelers have to wait 5 months before they can start winning again. And that forces Mike Tomlin and company to speak with words instead of actions. Given the context, Mike Tomlin’s response is just as pitch perfect as his predecessor Chuck Noll’s was 30 years ago. Steelers Trade Antonio Brown to Raiders for 3rd & 5th Round Picks – Robbery or Riddance? Accentuate the positive: It is over. Long before the Art Rooney II met with Antonio Brown, it became clear that the Steelers would trade their Hall of Fame talented wide receiver. And now that process is finally over as the Steelers trade Antonio Brown to the Oakland Raiders for a 3rd round pick and a 5th round pick in the 2019 NFL Draft. For both better and for worse, the soap opera is finally over. The story began back in December. During the Steelers heart breaking loss ot the Saints, thanks in no part to two bogus pass interference on Joe Haden, Antonio Brown had been on fire. 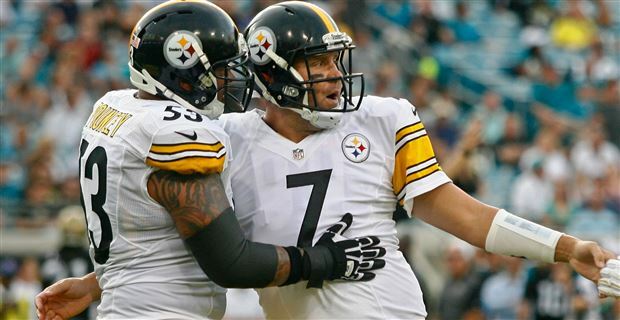 Ben Roethlisberger threw 19 passes his way, as Brown caught for 185 yards and two touchdowns. Yet, a few days later Antonio Brown’s name showed up on the Steelers injury report. Then, Jim Wexell mentioned that Randy Fichtner had begun his press conference with a preemptive “I’m NOT talking about Antonio Brown.” Antonio Brown didn’t play. 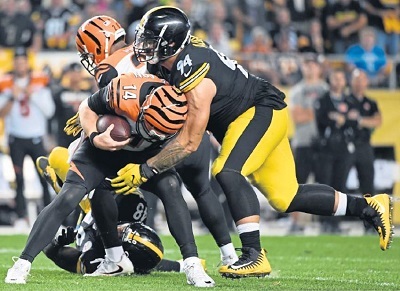 The Steelers came out and struggled to beat the Bengals, despite the return of James Conner. Shortly after the game (perhaps news leaked sooner) reports surfaced that Antonio Brown had walked out of Steelers practice due to an altercation with Ben Roethlisberger during practice. Mike Tomlin informed us that Antonio Brown ignored phone calls, although Drew Rosenhaus made calls to the coach. Mike Tomlin didn’t dispute a report that Brown had abandoned the team during its “Darkest hour.” Art Rooney II pulled no punches with reporters admitting that it was “Very hard to see” Antonio Brown returning to the team. Meanwhile, Antonio Brown proceeded to troll the Steelers at every turn on social media, mocking Mike Tomlin alongside with James Harrison during Tomlin’s press conference, photo shopping himself into San Francisco 49ers uniforms and otherwise acting like a buffoon. Yet, through it all, Antonio Brown managed to sway a good chunk of the national media to his side. Never mind that he was convicted for driving 140 miles an hour on McKnight Road. Never mind that he’d physically threatened one reporter and cursed out Ed Bouchette. Never mind that he’d been accused of throwing furniture off of a 14th floor balcony. Never mind Antonio Brown’s alleged involvement in a domestic dispute. 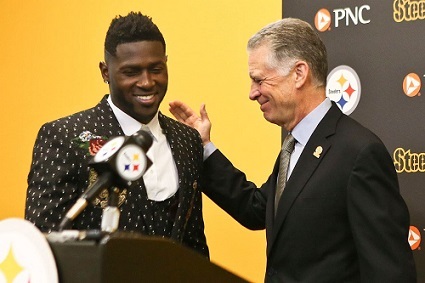 Never mind Antonio Brown needing his dad as a chaperone, unable to do a simple 1-1 with Art Rooney II. No, never mind any of that. Some how in the eyes of many in the media (Cris Carter excluded) Antonio Brown was a victim of a series of injustices leveled on him by Ben Roethlisberger, Mike Tomlin, Kevin Colbert and even Art Rooney II. Antonio Brown Trade Robbery or Riddance for Steelers? How about Both? 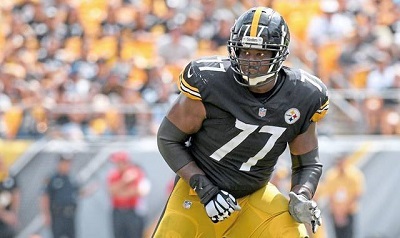 The Steelers had done their part to try to keep the door open to Brown’s return, with players like JuJu Smith-Schuster, Maurkice Pouncey and Cam Heyward treating Antonio Brown with open arms to one degree or another in the press. We know the answer now: Not much. I guess what goes around comes around. 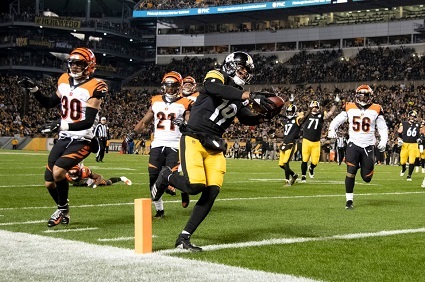 Last spring during the 2018 NFL Draft, the Steelers shipped troubled wide receiver Martavis Bryant to the Oakland Raiders for a 3rd round pick. Given that Bryant was one bong hit away from NFL oblivion it seemed like Kevin Colbert had gotten away with robbery. He had, and now Jon Gruden returns the favor. Antonio Brown is a Hall of Fame talent. While Brown did suffer a slow start to 2018, he was in Hall of Fame form when the season ended. He is the best receiver in the game and showed no sign of slowing down. He had a team-friendly contract. Yet, all the Steelers could give for him was a third round pick. However, this is hardly a surprise. In early January Jim Wexell reported that a team source had told him that a 3rd rounder might be the best they could do for Brown. Ed Bouchette had other NFL personnel men tell him that a 6th or a 5th might have been the best the Steelers could do. 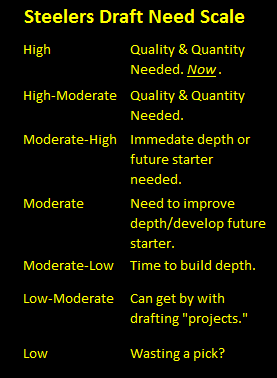 In the end, both were right as the Steelers got a 3rd and a 5th in the 2019 NFL Draft. In pure football terms, the Steelers got robbed. However, the Steelers did what they had to do. Perhaps, just perhaps, in early January there was a bridge that Antonio Brown could have taken back to Pittsburgh. Instead Antonio Brown chose to gleefully dump gasoline on that bridge at every chance he has gotten. At the end of the day, the Raiders may have robbed the Steelers, but the Steelers also rid themselves of locker room cancer that would have scuttled their 2019 season before it started. Just as some commentators were speculating that his chances of staying with the Steelers had improved, Antonio Brown has requested a trade, multiple sources have confirmed. The news came on the heels of social media posts made by Antonio Brown. Antonio Brown of course deserted his teammates in the week before the Steelers season finale against the Bengals after a reported dispute with Ben Roethlisberger. Shortly thereafter, Mike Tomlin and Art Rooney II confirmed that Brown had not been responding to repeated phone calls. Yet Antonio Brown was active on social media, deleting the Steelers from his profile, showing photo shopped himself with Jerry Rice wearing a 49ers uniform, trolling Mike Tomlin during his press conference with James Harrison and asking Steelers fans if they wanted him in Pittsburgh. Meanwhile news broke that Antonio Brown had been involved in a domestic dispute with the mother of one of his children. Reports suggest that Brown pushed the woman to the ground and perhaps hurt her wrist, although the woman has filed no criminal charges and did not make a formal criminal complaint. While most of the Steelers press corps and a sizable portion of the fan base has been ready to part ways with Brown, Steelers players have been more receptive. 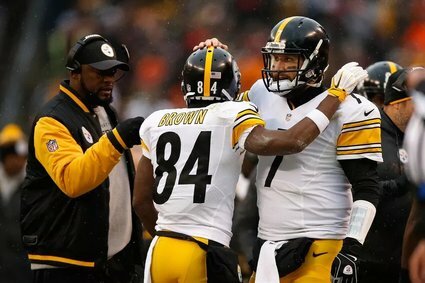 Ben Roethlisberger called for Antonio Brown to return, as did Maurkice Pouncey, as did JuJu Smith-Schuster. 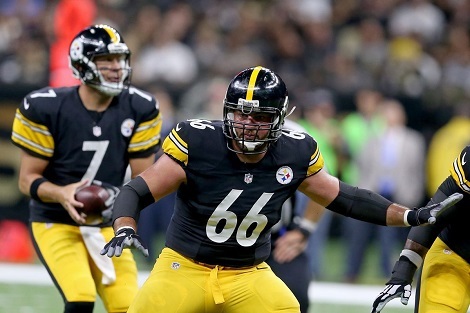 Cameron Heyward, who is one of the Brown’s more vocal critics, seemed to leave the door open to Brown returning. Time to Give Antonio Brown What He Wants? The issue of whether the Steelers should trade Antonio Brown has been a wrenching one. While Antonio Brown suffered a slow start to 2018, he was in All Pro from in Steelers loss to New Orleans. Nonetheless, Antonio Brown crossed and important line in the week leading up to the Bengals game, and some players felt that the Steelers didn’t react strongly enough, although it appears Brown was testing Mike Tomlin to see if Tomlin really would bench him. It should be noted, that if one reads between lines of Art Rooney II’s comments, the Steelers appear to have at least investigated suspending Brown for his week 17 no show. While the Steelers have offered no confirmation that they’ll look to move Antonio Brown, it is hard to imagine them trying to insist he stay in Pittsburgh. But if today marks the no turning back point for Antonio Brown and the Steelers, then the question remains what exactly can Pittsburgh get in a trade? Ah with numbers like that visions of Kevin Colbert engineering a 21st century like equivalent of the Hershel Walker trade abound, don’t they? Alas, it is not so simple. Yet in early January, Jim Wexell was reporting that one Steelers insider told him that the best they might get for Brown is a 3rd round pick. Ed Bouchette of the Pittsburgh Post-Gazette quoted an anonymous NFL personnel man as saying the best Brown could net would be a conditional 4th round pick. It says here that the Steelers need to try to get the best value they can for Antonio Brown. On paper, a swap of 1st round picks and Antonio Brown with the 49ers seems reasonable. But if the pundits have it right, and Antonio Brown’s antics have poisoned the well as much as they seem to have, then Brown won’t bring the Steelers much in a trade. And if the Steelers are forced to deal Antonio Brown for a fire-sale like trade value, then they need to get him as far away from Pittsburgh as they can. That means not only sending out of the AFC North, but ideally out of the NFC, and to a struggling NFC team with an unsettled quarterback situation. While it would be tempting to do this out of spite, the real reason would be to limit the likelihood that Brown’s Hall of Fame talents can be employed against the Steelers. There’s not much difference between a mid 5th or a mid 6th pick, so if that’s all you’re going to get, better to send Antonio Brown to the Washington Redskins, Detroit Lions or New York Giants than to let him land with the New York Jets, Buffalo Bills or say Denver Broncos. So Be It. The Steelers should oblige him by sending him as far into NFL oblivion as possible if Brown has already made it impossible for them to get fair market value for his talents.